The warm ringing of Christmas bells is a welcoming expression to all who hear their joyous tones during the holiday season. Oftentimes, the beautiful bells at Christmas time will play carols to bring everyone in to the holiday spirit. Bright and cheerful bells can be yours to own this holiday season with the bell decorations from the Christmas Warehouse. Each bell decoration is pre-decked in holiday splendour. From bright metallic ribbons to embroidered greetings to evergreen accents, each unique and beautiful set of bells is ready to hang from your tree or wall. You could easily hang Christmas bells near the entryway of your home to welcome your guests with cheer. The Christmas bells come in bright, Christmas colours for holiday spirit, as well as classy silver and blue shades for an icy effect. The Christmas bells are glamorous and decorated. Their metallic sheen will add elegance to any décor. The bells are a classic symbol of the beautiful sound of ringing bells. Christmas bells have long been a beautiful element of the holiday season. Their melodious charming tones have inspired countless poems and carols of the Christmas season. From the elegant sheen to the dulcet tones, bells are a wonderful way to decorate your home for the holidays. 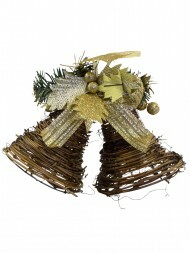 These bells are fabulous size for decorating in your home or workplace. 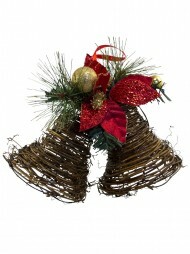 They are sure to add Christmas cheer to any room. The Christmas Warehouse has everything you need to deck your home or workplace for the holiday season. Decorations have a way of bringing cheer on even the dreariest of days. Brighten your space this season with the Christmas Warehouse.